The Environment Team have partnered with outdoor adventure group Blown Away Experiences, to deliver a hugely successful Green Raisin Competition, which seeks to promote and reward environmentally-friendly behaviour amongst students. Modern ‘raisin receipts’ have made a departure from traditional Latin parchment once given to academic children and have since gained a reputation for being oversized, unwanted items instead. This has become a problem when it comes to their disposal as they are hard to recycle and contribute to landfill waste. To combat this waste, students are being encouraged to think about the environmental impact of their receipt and costume efforts. Now in its third year, the Green Raisin Competition encourages academic parents to design their children’s costumes and receipts so that they are made from reused materials, which are light and easily recyclable. Congratulations to this year’s winning entry which was both creative and gave consideration to its environmental impact. Their ‘dragon’ costume was made entirely of unwanted cardboard boxes gathered from shops around St Andrews, bed sheets from local charity shops and old bamboo canes from their garden. 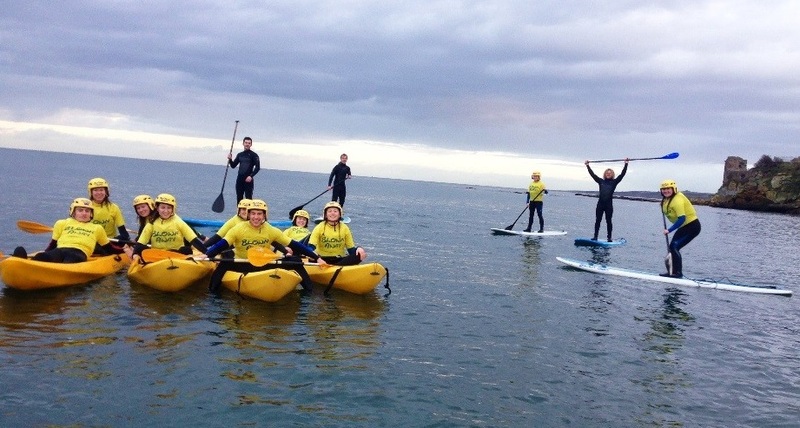 As a reward, the winning family were treated to a kayaking and SUP-ing (stand up paddle boarding) session, courtesy of Blown Away Experiences. These efforts to engage students with waste reduction were acknowledged at the Public Sector Sustainability Awards, where St Andrews were ‘Highly Commended’ in the Best Waste and Recycling category. Here are the highlights for all things sustainability-related in St Andrews during Freshers’ Week – don’t miss out! 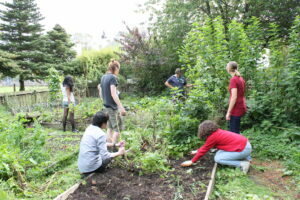 The Big Green Fair (St Katherine’s Lawn behind Library, 11am-3pm) is an outdoor festival celebrating the environment, with live music and great local food. Find out more about what our eco-friendly societies are up to this year and how to get involved in their activities & projects. Carbon Conversations is a free 6-session programme run in St Andrews which looks at individual carbon footprints and what can be done to reduce them, through interactive sessions which include games and group discussions as well as individual reflection. This taster session will introduce you to some of the activities so you can decide if it is for you, while enjoying lunch in the beautiful surroundings of the St Andrews Botanic Gardens. Bring a friend and pick up some great energy and money-saving tips! Passionate about development and Fairtrade? Then come to our stall at the Charitable and Volunteering Fair and find out how you can get involved. This is an especially exciting time to do so as the town is celebrating its 10 year anniversary as a ‘Fairtrade Town’ and the University will also be celebrating its 10 year anniversay, in 2016. What are you waiting for? Looking for a cheap, green and healthy way of getting around town? Want to learn how to fix your bike? Then come along to our annual and extremely popular second hand bike sale! This year Bikeworks will bring bikes, teaming up with St Andrews Bike Pool so you can learn to fix your new bike or bring along one you own already to ensure it’s in good working order. We sell out very quickly so make sure to be early to avoid disappointment! End of term – what happens to all our “stuff”? You’ve finished your exams, packed your bags, donated your unwanted items, and you’re ready to leave St Andrews for the summer…but what happens to all the “stuff” students donate? From pots and pans to coathangers, stationery, and a wide variety of miscellaneous household goods, St AndRe-Use volunteers collect all these items from hall donation points and from STANDEN’s private residence collections. After some intensive sorting sessions (see above! ), the cutlery and crockery is washed in hall dishwashers, then everything is boxed up and stored for the rest of the summer. Once students return in September, the items are taken along to the Freshers’ Week Big Green Fair where the thousands of items are given away for free to be used and enjoyed by another cohort of students! Donations of clothes and accessories are collected by Frontline Fife, a local charity that provides services to help alleviate the effects of homelessness. Donated items are either passed directly onto those in need, or used to stock their Kirkcaldy-based boutique, “Re-Love It”, which raises funds for their projects. All donations of unopened, non-perishable food, toiletries, and cleaning products are collected and taken to St Andrews’ food bank, Storehouse, where they will be used to help local families in need. Whether it’s a novel or a course textbook, all books dropped off at donation points are collected by Barnardo’s and taken to be re-sold in their shop on Bell Street, raising funds to help transform the lives of some of the UK’s most vulnerable children. Click here for more information on what to do with your end of term waste. Everyone knows that it’s a good idea to recycle, but did you know that recycling actually falls quite far down on the order of preference for managing waste? This order of preference is commonly known as the waste hierarchy, as shown in the diagram below. This diagram clearly shows the different options for waste management (“the 6 R’s”), with the most favourable option (refusing waste) located at the top of the triangle, and the least favourable option (rot – sending waste to landfill) at the bottom. So how can the 6R’s help you reduce the environmental impact of your waste? REFUSE to buy things you don’t need, and refuse to buy products that come overly packaged (like a box inside a box, wrapped in plastic, in a box…you know the sort! ), or that you know will have limited lifespan. REDUCE the amount of goods that you do need. The idea is to consume less, which results in less waste produced. Look out for multi-purpose products, and buy in bulk where possible e.g. buy larger sizes of toiletries, washing detergent, non-perishable food (pasta, rice, lentils), etc. REUSE items you no longer need. Get creative and try to find alternative uses for your items, (inspiration available here and here) or donate them to a charity shop. For larger items, such as furniture, large electricals, and bikes, call the National Reuse Phoneline who will collect your items for free and give them a new lease of life. RECYCLE items you cannot reuse. Look up your local council’s recycling guidance to make sure you are clued up on what you can and cannot recycle (Fife’s recycling information is available here) to make sure you are recycling as much as you can! Find your nearest recycling point, and use the banks of recycling bins located in all university buildings when out and about. Remember you can also recycle your glass, batteries, printer cartridges, and waste electricals, with more information available on our website. RECOVER energy from your food waste if you don’t use it in a composter at home. By separating your food waste from the rest of your waste, it can be collected and anaerobically digested to produce biofuels and other useful products. Find out what happens to your food waste in Fife here. ROT – the least favoured option. The waste you cannot reuse, recycle, or recover energy from will be sent to landfill or incinerated. Follow the 6 R’s and see how empty you can make your landfill waste bin…and as an added bonus, by having less stuff in it you won’t have to empty it as often! After the festive season is over, be sure to recycle your cards and wrapping paper. Try to avoid foil wrapping paper as this is much harder to recycle, and look out for cards and wrap made from recycled paper or FSC certified materials. Alternatively, package your presents in decorative, re-usable boxes, bags, or fabric wraps, like these ones from Lush. At this time of year, people often receive gifts of new models of items they already own, such as cameras, televisions, hairdryers, MP3 players, mobile phones, and other electrical goods. Recycle the replaced goods by selling them, donating them to charity, or taking them to your local recycling centre. Using LED lights to decorate your home will not only reduce your energy use by up to 90% compared to traditional lights, but also save you money on your utility bills. Remember to turn the lights off before going to bed to avoid wasting energy. Ribbons and bows are often in perfect condition after a gift has been unwrapped. Stop them from ending up in landfill by saving them to reuse next year. There will inevitably be lots of leftover food after you’ve enjoyed your Christmas dinner. Check out these recipes for tasty and imaginative ways to make the most of your leftovers, and reduce your food waste. Moroccan turkey salad or Christmas pudding trifle, anyone? Christmas decorations can be very expensive, so why not see what you can make from what you already have? Check out this page for suggestions, or if you want more ideas, a quick search on Pinterest produces thousands of results for DIY decorations! For more tips on how to cut your Christmas waste, check out last year’s blog post, and our green gift guide. 3 Simple Tips for a Happy Hallogreen! 1. Costumes – vintage, reused, DIY – oh my! Throw on a checked shirt, jeans, hiking boots, and hat then draw on a beard (mascara works well) – simple! Requires a bit of effort put into the makeup, but the result is very effective – check out YouTube for tutorials. Bright yellow hair optional. Dig out your green clothes, tie some coloured ribbon or strips of coloured fabric round your head, then make a shell by painting a disposable baking tray green. Kowabunga. Give your voice a rest and express yourself through actions…complete the look with some black trousers, a stripy top, and some face paint. Put your hair up and tie a red ribbon or strip of material (try charity shops if you don’t have any) round your head for an iconic, yet incredibly easy costume. Planning a Halloween party? Don’t waste money buying decorations – get creative and make your own by upcycling some of your household waste! Get out your scissors and some black paint to transform an egg carton into a cute bat decoration. Make this dapper skeleton out of empty plastic milk bottles. Transform your glass jars into ghostly lanterns with the help of some muslin cloth. These bat ornaments are really easy to make by upcycling some loo rolls. If you’re carving a pumpkin this year, try and buy one that is locally grown and organic. When carving it, don’t forget to save the seeds and flesh – roast off the seeds with a little oil and salt, and use the flesh to make pumpkin bread, pies, muffins, soups, and more! Check out BBC Good Food for recipes, and remember to dispose of your pumpkin after Halloween by putting it in your food waste bin. Carrier Bag Charge (Scotland) – What’s It All About? Have you spotted posters like this one popping up in shops? The adorable elephant is named Ernie, and he’s helping spread the word about the single use carrier bag charge coming into force in Scotland from 20th October. This means that no matter whether you’re shopping for groceries, clothes, books, toiletries, or any other item, if you want a bag to put them in you will be charged 5p. Why are we being charged? The legislation has already been introduced in Wales, and after just one year of the law being in place, the use of new plastic bags decreased by 75%. Where does the 5p go? The proceeds from the 5p charge will go to environmental charities and other environmental initiatives. It’s simple – take a re-usable bag with you every time you shop! You can reuse bags you have previously been charged 5p for, although they may wear out after some time. Supermarket “Bags for Life” last a bit longer, and most supermarkets replace them free of charge when worn out. Cotton tote bags are more expensive than plastic “Bags for Life”, but will last longer and are more convenient to carry around than jute or woven bags. We’d recommend you go for Fairtrade cotton if available, or bags made from organic cotton. There are loads of cool designs to choose from, they fold up small enough to pop in your bag or pocket, and will help you avoid that 5p charge. For more information on the carrier bag charges, check out Carrier Bag Charge Scotland’s FAQs. For all those students out there with the May Dip just past and exams around the corner, it’s time to start preparing for the End of Term mayhem. It’s not always easy or feasible to bring all you belongings with you when you leave for the summer. That’s why we’ve come up with a handy guide to help you make the most of any items you wish to leave behind. Please remember that you might be charged for items left behind in flats and halls of residence if they are not properly disposed of. It’s always best to reuse first, then resell, donate or, if beyond repair, recycle. Help us achieve Zero Waste by making sure nothing ends up in landfill that doesn’t have to! If you’ve found this guide helpful please let us know by leaving a comment below. Over the holidays everyone likes to have a good celebration. Unfortunately, with all that extra eating, drinking and present-buying, this tends to lead to a lot of rubbish, we produce over 3 million tonnes of waste over the festive season. This includes 1 billion greeting cards, 83 square kilometres of wrapping paper, 750 million extra glass bottles and containers, and 500 million extra drinks cans. However, this doesn’t have to be the case. Here are some tips on how to have a greener holiday break. What do you get for somebody who has everything? An experience. Why not take them out to dinner, or buy them theatre tickets? Not only can you give them a pleasant evening and a lasting memory, but it won’t end up sitting around the house, cluttering up the place, or even ending up in the bin…. Alternatively, you could buy some trees or an animal for a community in the Third World, on their behalf. Oxfam and various other organisations provide the opportunity to pay to plant trees, or buy animals for communities in the Developing World. Or you could sponsor an animal on their behalf. Buy gifts made from recycled material, or gifts produced by local craftsmen. If you are buying perfume or cosmetics, buy those made from natural ingredients, or those that haven’t been tested on animals. Where you have the option, buy presents and food with as little packaging as possible. Reduce the number of plastic bags floating around your house by using cloth shopping bags/rucksacks/Bags for Life. Not only will you be helping the environment by doing this, but cloth bags are much stronger, and better able to support all those presents you are buying. As if those weren’t reasons enough, Tesco is now awarding Green Club Points for people who don’t take new plastic bags. Some live Christmas trees can be replanted after Christmas. Why not plant yours in your garden after Christmas is over? It can then be dug up next year, or decorated and left in the garden. Alternatively, you could buy a reusable plastic tree. If you’re buying any toys this Christmas, try and avoid ones requiring batteries, which will eventually end up in the waste stream. Not only will you be reducing waste, but you’ll be saving energy as well: a double win! If you do buy battery-powered presents, put rechargeable batteries in them. If you’re having a party, think about using reusable plates and cups, so that they don’t need to be thrown away afterwards. If you don’t want to buy that many items, there are a number of places where you can hire them for the evening. When you’re buying presents, think about buying things that will last, rather than needing to be replaced after a few weeks, when it falls apart. That way, people will remember your generosity for longer. If this will cost more, why not club together with a friend or relative? Wrapping paper is often still in good condition after it has been used. Why not save it up and reuse it next year? When travelling home for Christmas, why not travel by train or by bus? It is often as quick and as cheap as flying, if not cheaper and quicker. Staff across the University of St Andrews have donated educational resources for schools in Namibia, to help children in need. Earlier this month, the Environment Team coordinated efforts to collect items for a container that was arranged by Madras College as part of their Namibia Teaching Program. Around 30 students from Madras are travelling Namibia this summer to work with kids in schools and organised this container ahead of their travels. See this website for photos of their 2011 trip http://www.madras.fife.sch.uk/news_events/namibian_trip_2011.html. The appeal for resources went out under a week before the container was due to depart and despite the short timeframe we were hugely impressed by the outpouring of support from departments across the University. Schools and Units that contributed were: CAPOD, English Language Teaching, Environment Team, IT Services, Media Services, New Hall, School of Biology, School of Classics, School of Computer Sciences, School of Economics and Finance, and School of Psychology, and the University Library. Thanks to their generous support a whole van load of goodies was collected which ranged from almost 10 overhead projectors, six computers, English language learning books, stationary and welcome packs with shampoo, soap and toothpaste and amounted to 2 tonnes of resources. A huge thank you to everyone who donated and to Bill Close in the Grounds Department for his help with packing and transport! Special thank you to WHSmith for donating office supplies (including disks for the new computers!) and to PHS Teacrate who supplied crates and other packaging materials (including loads of big bubble wrap!). With everyone working together not only are we helping those in need of assistance in Namibia, but we are making sure that valuable resources are put to use and not wasted. Keep your eyes open for future donation and reuse opportunities!